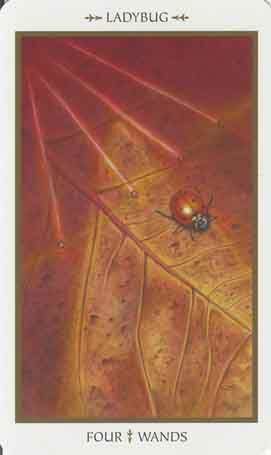 Symbols*: The ladybug positions itself on a red leaf. The red colors signify life passions and robust material gains. The leaf is ripe after a season of resplendent growth. The ladybug is hardbinger of good luck. Its appearance indicates a period of happiness and security. The four dew-topped wands work together to create kinetic energy. The unifying energy penetrates the organic fibers of the delicate leaf, thus connecting the fiery mind with the stability of earth matter. The rays emanating from the wands are propelling the ladybug to move forward and to continue on its journey after it has completed its respite. Description*: After a period of hard work, you deserve to take time off and relish your achievements. Your diligence has resulted in a more relaxed and secure situation. You can now indulge in your passions and allow yourself to recharge before embarking on future projects. Possible Meaning: After a period of hard work, you deserve to take time off and relish your achievements. It is now time for a bit of rest and recharging before embarking on future projects. The appearance of a Ladybug heralds a time of luck and protection in which our wishes begin to be fulfilled. Their presence signals a time of shielding from our own aggravations and pests. Fall and Spring are the most abundance times for a person with a Ladybug totem. Higher goals and new heights are possible with a Ladybug totem. Worries begin to dissipate. New happiness comes about. Ladybug also cautions not to try to hard or go to fast to fulfill our dreams. Let things flow at their natural pace. In the due course of time, our wishes will all come true.